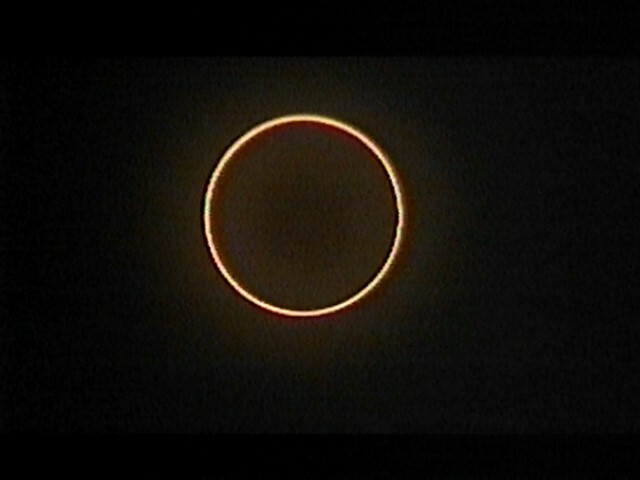 Explanation: An annular eclipse of the Sun was visible in parts of the Eastern Hemisphere on Saturday. The above picture was taken at that time by a video camera in Mersing on the East Coast of Malaysia and emailed to APOD yesterday from an internet cafe in Kuala Lumpur. 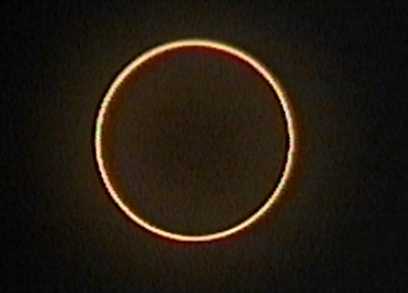 An annular solar eclipse will occur when the Moon's angular size is slightly less than the Sun's angular size. Therefore, when the Moon is directly in front of the Sun, the edges of the Sun are still visible. This solar ring is so bright that the Moon's surface normally appears dark by comparison. The angular sizes of the Sun and Moon change slightly because of the elliptical nature of the Moon's and Earth's orbit. A total solar eclipse would have occurred were the Moon much closer to the Earth.